TLJ News: February 6-10, 2014. 2/10. The Copyright Office (CO) published a notice in the Federal Register that announces that it seeks another round of public comments regarding orphan works and mass digitization, and will hold another public hearing. The deadline to submit comments is April 14, 2014. The hearing will be held in Washington DC on March 10-11, 2014. See, FR, Vol. 79, No. 27, February 10, 2014, at Pages 7706-7711. The CO initiated its last round of comments and hearings in 2012. See, story titled "Copyright Office Issues Notice of Inquiry on Orphan Works" in TLJ Daily E-Mail Alert No. 2,468, November 2, 2012. On this matter the CO largely acts as an agent of the Congress, and especially its judiciary committees. This notice discloses that if the Congress is to consider legislation, that process would likely not occur at least until the commencement of the 114th Congress in January of 2015. 2/10. President Obama nominated Robert Work to be Deputy Secretary of Defense. See, White House news office release and release. He served in the Marine Corps for 27 years. He worked at Center for Strategic and Budgetary Assessments (CSBA) from 2002 to 2009. He was Under Secretary of the Navy from 2009 through early 2013. 2/7. The Department of Justice's (DOJ) Antitrust Division announced in a release that it has closed its investigation into Samsung's assertion against Apple of rights in standards essential patents (SEPs) subject to fair, reasonable and non-discriminatory (FRAND) commitments. The DOJ wrote that it is "closing of its investigation into Samsung Electronics Co. Ltd.'s use of its portfolio of standards-essential patents that it had committed to license to industry participants on fair, reasonable, and non-discriminatory terms (SEPs) to exclude certain Apple, Inc. products from the U.S. market". It added that its investigation "focused on Samsung’s attempts to use its SEPs to obtain exclusion orders" from the U.S. International Trade Commission (USITC) "relating to certain iPhone and iPad models." The USITC issued a Section 337 exclusion order in June of 2013 banning importation of certain Apple devices that infringed certain Samsung patents. See, story titled "USITC Enjoins Importation of Certain Older iPhones and iPads" in TLJ Daily E-Mail Alert No. 2,570, June 4, 2013. However, the U.S. Trade Representative, Michael Froman, overturned that exclusion order in August. The DOJ concluded on February 7 that "As a result of the USTR's action, the Antitrust Division has determined that no further action is required at this time. The Antitrust Division is therefore closing its investigation into Samsung’s conduct, but will continue to monitor further developments in this area." Various US entities work under sometimes conflicting policy objectives -- promoting innovation by conferring exclusive rights in inventions, promoting competition and consumer welfare through application of antitrust law, protecting national security, and protecting US economic interests from foreign competition. The U.S. Patent and Trademark Office (USPTO) has authority to issue patents. Actions for damages for infringement, and for injunctive relief, lie in the U.S. District Court. In addition, the USITC has authority to issue exclusion orders to protect patents rights. Section 337, which is codified at 19 U.S.C. § 1337, provides, in part, that may issue such orders in the case of "The importation into the United States, the sale for importation, or the sale within the United States after importation by the owner, importer, or consignee, of articles that ... infringe a valid and enforceable United States patent or a valid and enforceable United States copyright registered under title 17". The Federal Trade Commission (FTC) and DOJ both enforce antitrust laws. They have divided their responsibilities by industry sectors. The DOJ handles telecommunications. Federal courts have construed the purpose of these statutes to be protection of competition and consumer welfare. The DOJ and USPTO issued a joint policy statement [10 pages in PDF] dated January 8, 2013 on the subject of reconciling the policy goals of patent protection with competition promotion. See also, story titled "DOJ and USPTO Issue Statement on Injunctive Relief for Infringement of SEPs Subject to FRAND Commitments" in TLJ Daily E-Mail Alert No. 2,506, January 9, 2013. Apple is a US company. Samsung is a Korean company. The two compete in the sale of smart phones. Both hold large smart phone patent portfolios. Both filed complaints against the other in the District Courts, and with the USITC. The USITC issued two exclusion orders based upon patent infringement -- one directed at Apple, and one directed a Samsung. The President may overturn these exclusion orders within 60 days, pursuant to 19 U.S.C. § 1337(j). As a practical matter, the President acts upon the recommendation of the USTR, who ordinarily denies requests to overturn exclusion orders. However, Froman overturned the Apple order, but not the Samsung order. See, story titled "USTR Froman Disapproves USITC Exclusion Order in Samsung Apple Proceeding" in TLJ Daily E-Mail Alert No. 2,587, August 6, 2013, and story titled "USTR Declines to Overturn USITC's Section 337 Samsung Exclusion Order" TLJ Daily E-Mail Alert No. 2,611, October 9, 2013. This pair of actions, in the least, created the appearance of favoritism and protectionism. Froman referenced the DOJ/USPTO policy statement regarding SEPS subject to FRAND commitments. And, the DOJ in its just issued release referenced that policy statement. However, Froman's August determination made no attempt to apply the principles of that DOJ/USPTO policy statement to the facts of that proceeding. He did not base his determination upon a finding that Samsung asserted SEPs subject to FRAND commitments. Similarly, the DOJ's just issued release does not apply the policy statement to its just closed review. The DOJ wrote that "a number of competitive issues arise when holders of SEPs seek to block their competitors from selling products that implement the SEPs. While there are certain circumstances where an exclusion order as a remedy for infringement of such patents could be appropriate, in many cases there is a risk that the patent holder could use the threat of an exclusion order to obtain licensing terms that are more onerous than would be justified by the value of the technology itself, effectively exploiting the market power obtained through the standards-setting process." But, the DOJ release merely offers this general statement, without reaching any conclusions as to Samsung. The DOJ added that "readers should not draw overly broad conclusions regarding how the division is likely in the future to analyze other collaborations or activities, or transactions involving particular firms. Enforcement decisions are made on a case-by-case basis, and the analysis and conclusions discussed in this statement do not bind the division in any future enforcement actions." This closing thus provides very little in the way of precedent or guidance to other companies. Nor does it provide finality for Apple and Samsung. The European Commission (EC) is still conducting a parallel and redundant review of the same conduct. 2/6. The Senate confirmed Sen. Max Baucus (D-MT) to be Ambassador to the People's Republic of China (PRC) by a vote of 96-0-1. See, Roll Call No. 25. Sen. Baucus (at right) voted present. Three prairie state Republicans did not vote -- Sen. Tom Coburn (R-OK), Sen. Jerry Moran (R-KS), and Sen. Pat Roberts (R-KS). 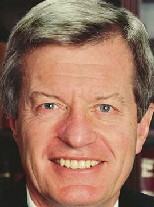 Sen. Baucus was elected to the House with the post Watergate class of 1974. He has served in the Senate since 1978. See also, story titled "Obama to Name Baucus Ambassador to the PRC" in TLJ Daily E-Mail Alert No. 2,622, December 18, 2013, and Sen. Baucus Will Not Seek Re-Election in 2014" in TLJ Daily E-Mail Alert No. 2,552, April 22, 2013. Sen. Baucus stated in the Senate on February 6 that "The United States-China relationship I believe is one of the most important bilateral relationships in the world that will shape global affairs for generations. We must get it right. Thirty-eight years ago, Mike Mansfield said farewell to this institution by simply declaring: ``There is a time to stay and a time to go.´´ Now, as I face my own crossroads, I am humbled to have the opportunity to follow in his footsteps. As America's ambassador to Japan, Mansfield worked hard to strengthen and improve America's relationship throughout history. I will try to do the same." See, Congressional Record, February 6, 2014, at page S800. Sen. Sander Levin (D-MI) stated in the Senate that "Our relationship with China is more important than ever. Decisions made today will affect that relationship for decades to come. We are seeking to cement a positive relationship, one in which China joins with our friends and allies in the Asia-Pacific Region to support collective security and economic growth, and fosters stability through adhering to international norms. As the representative of the American people in Beijing, MAX will be instrumental in getting and keeping the U.S.-China relationship on a positive footing. He will be in a crucial position to help open Chinese markets to American goods." 2/6. Sen. Max Baucus (D-MT), who as just been confirmed as Ambassador to the People's Republic of China (PRC), served as either the Chairman or ranking Democrat on the Senate Finance Committee (SFC) since the retirement of the late Sen. Patrick Moynihan (D-NY) in 2000. Sen. Ron Wyden (D-OR) is now set to become the next Chairman of the SFC. Both providers and consumers of many technology related goods and services have reason to be enthusiastic about Sen. Wyden's elevation. He is the sponsor or lead cosponsor of several tech related tax or trade bills over which the SFC has jurisdiction. However, whether he will be able to win passage of these bills is another matter. Sen. Wyden (at right) has served in the Congress since 1981. During his House years he sat on the House Commerce Committee (HCC), and was active on information technology related issues. He and former Rep. Chris Cox (R-CA) were instrumental in winning passage of the original Internet Tax Freedom Act (ITFA) in 1998. He played a similar role in his early years in the Senate, when he served on the Senate Commerce Committee (SCC). However, he soon gave up his seat on the SCC to obtain his seat on the SFC. This reduced his opportunities for shaping information and communications technology law and policy. On the SFC his views on major tax issues are in line with many liberal Democrats. However, he diverges on some tech related tax issues. Sen. Wyden was an opponent of S 743 [LOC | WW], a bill to authorize states to compel out of state retailers to collect sales taxes on internet and other remote sales. The Senate passed this bill on May 6, 2013. Sen. Baucus opposed this bill as well. Sen. Harry Reid (D-NV) brought the bill to the Senate floor, without allowing the SFC to consider it first. This deprived Sen. Baucus of the opportunity to use his Chairmanship to block, delay, or revise the bill. There is no reason to expect to Sen. Wyden to be any more effective on this issue than Sen. Baucus was. There are also several other tech or trade related issues within jurisdiction of the SFC that Sen. Wyden might press during the remainder of the 113th Congress. He and Sen. John Thune (R-SD) (at right) have formed a partnership, similar to the Wyden Cox partnership in the House. Both are members of the SFC. Internet Tax Freedom Extension Bill. Sen. Wyden, Sen. Thune and others introduced S 1431 [LOC | WW], the "Internet Tax Freedom Forever Act" on August 1, 2013. It was referred to the SFC. For a summary of the history of the ITFA, and bills pending in the 113th Congress, see story titled "House Members Introduce Internet Tax Freedom Act Extension Bill" in TLJ Daily E-Mail Alert No. 2,600, September 12, 2013. There are several pending bills that would make the ITFA permanent. S 1431 is different in that it also contains a list of seven Congressional findings. The key House bill is HR 3086 [LOC | WW], the "Permanent Internet Tax Freedom Act", sponsored by Rep. Bob Goodlatte (R-VA). It has a total of 91 sponsors, but has not yet been approved by the House Judiciary Committee (HJC), which has jurisdiction. The current ban provides that "No State or political subdivision thereof may impose ... Taxes on Internet access" or "Multiple or discriminatory taxes on electronic commerce". There are, however, grandfathered taxes, and numerous exceptions. This ban is codified in the notes to 47 U.S.C. § 151. It is set to expire on November 1, 2014. Digital Goods and Services Tax Fairness Act. Sen. Wyden and Sen. Thune introduced S 1364 [LOC | WW], the "Digital Goods and Services Tax Fairness Act" on July 25, 2013. It too was referred to the SFC. This bill would prohibit state and local governments from imposing multiple or discriminatory taxes on the sale or use of a digital good or service delivered or transferred electronically to a customer. Sen. Wyden and Sen. Thune also introduced S 971 [LOC | WW], the predecessor bill in the 112th Congress, on May 12, 2011. See, story titled "Representatives and Senators Introduce Digital Goods and Services Tax Fairness Act" in TLJ Daily E-Mail Alert No. 2,241, May 14, 2011. The SFC took no action of S 971 in the last Congress. The SFC has taken no action on S 1364 in the current Congress. Rep. Lamar Smith (R-TX) has unsuccessfully led efforts to move companion legislation through the HJC. Digital Trade Act. Sen. Thune and Sen. Wyden introduced S 1788 [LOC | WW], the "Digital Trade Act of 2013", on December 10, 2013. It too was referred to the SFC. This bill would express the sense of the Congress. For example, it states that the Office of the U.S. Trade Representative (OUSTR) "should be staffed with experts and leaders to fulfill the mission of promoting an open, global Internet that facilitates commerce and digital trade". This bill would also establish numerous negotiating principles for all "negotiations for a bilateral, plurilateral, or multilateral agreement, and in multi-stakeholder fora". The OUSTR should "seek the inclusion of binding and enforceable provisions that promote and enhance Internet-enabled commerce and digital trade". For example, the OUSTR should seek "preventing or eliminating barriers to the movement of electronic information across borders, including by encouraging interoperability of data protection regimes and eliminating barriers to accessing, processing, transferring, or storing information". Wireless Tax Fairness Act. 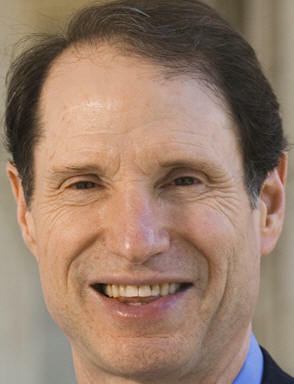 Sen. Wyden introduced S 1235 [LOC | WW], the "Wireless Tax Fairness Act", on June 26, 2013. It too was referred to the SFC. However, Sen. Pat Toomey (R-PA) is the lead cosponsor. Sen. Thune is not a cosponsor. This bill would prohibit state and local governments from imposing new discriminatory tax on mobile services, mobile service providers, or mobile service property, such as phones, for five years. Rep. Zoe Lofgren (D-CA) has long unsuccessfully led efforts to move companion legislation through the HJC.